Do you have to reconcile after forgiving? And that’s only between you and God. It’s a lot more work and much less predictable. To live a transformed life, you need to forgive, then ask God if you should reconcile. How has Jesus helped you to reconcile? Just leave your comments in the box below. Who is the hardest person to forgive? Father God has led me through a few lost friendships in the past 10 years. Some were with longtime Christian friends that I believed reconciliation was necessary but in reality were toxic relationships. I forgave them fully but am relieved to not have the stress and drama in my life anymore! The relationship with my mother has been the hardest. I had a lot of baggage that I had to give to God and I eventually wrote a loving letter to her, stating facts, and without emotion. Unfortunately she chooses to ignore my boundaries again and again, and it’s very disheartening. I pray that she would see how her actions have separated us from her, including my siblings and all her grandchildren. God is good, and I’m so glad I can lean on Him! I appreciate the perspective you have given as to how I need to forgive to be forgiven by Father God but that reconciliation takes two people who want to press forward to rebuild trust and understanding. I can see how my baggage and the baggage of others sometimes prevents reconciliation to become full and complete. When trust has been bruised, along with the enemies attempts to suggest I can see this rift with another person as reason to protect myself rather than press in, the process of reconciliation can be strident, uncertain, and fruitless. As you mentioned, I really need to be asking the Holy Spirit what He wants me to change as well and what part of my baggage may be getting in the way to assist in a more full and complete reconciliation. Because it takes two willing people to participate in this process of being reconciled after whatever has gone on, I can also see the need to have emotional space for each person to catch up with themselves and be able to safely and calmly talk. All too often I have attempted reconciliation before I have really caught up with myself, hoping that I can reach some understanding about the problem in the moments of feeling troubled. Hoping to roll the forgiveness, reconciliation and return to peace process all into one, as quickly as possible, disrespects myself and the other person. I think I hear some baggage in there for me. I pray Abba Father opens the eyes of my heart and spirit to rest in Him and walk with Him in each of these areas. May I grow in peace with more full and complete forgiveness and reconciliation when I meet conflicts and hardships. May He open my eyes to my baggage, and set me free. I had not spoken to my Fathers 3rd wife after he passed away for 22years. My dad and his wife split up 6months before he died. I knew her and she was part of my family for 18 years. After my dad died I kept up our relationship for a few months but after that time I called her and her boyfriend told me that she said she will call me if she ever gets a chance. Their was a lot of confusion due to inheritance stuff and I had to deal with my father lying to me about the will. I decided to write her a letter and I just wanted closure about the inheritance stuff. She sent me back a balance sheet with a 0 crossed out. I was so devastated and felt betrayed and rejected by her. The Holy Spirit inspired me to forgive her and pray for her which was difficult but I knew I had to. After 22 years I heard something that happened to her and my heart broke for her. I was lead by the spirit to visit her at her office. When she saw me she was shocked and I asked her to please forgive me for all the judgements I had made about her. We both embraced each other and she said that their was nothing to forgive. The Lord opened my eyes to see her as a daughter even though she doesn’t know him, all the pain I felt and lack of trust disappeared because I do not trust in people but in the Lord and my identity does not depend on whether people approve of me or what they do to me. I am incredibly loved and accepted and have no lack in Jesus. I have had the opportunity to pray with her and the past is like it never happened. I am free and so is she . We are totally reconciled , amazing love and grace. Jesus is awesome! These are amazing testimonies! Thanks for sharing. I find it liberating to know that forgiveness is mandatory but reconciliation is not, and that is something between me and God. I received an email from a former pastor telling me that I shouldn’t get married to my fiance. This was very hurtful, but to be honest I was expecting that she would say that she had a dream from God that I was going to die or something! That is how much fear is in the relationship. Currently, I just don’t know how to respond to her. I forgive her because I know the enemy is using her to try destroy my marriage and my confidence. Yet, I think I am just done with this relationship, and in order to protect my marriage I just don’t think I can have this person speaking into my life anymore at all. I really can’t trust her and it is sad that I would have to choose to say goodbye in a sense, but I really have to do what is best for me and my fiance. Sometimes the hardest thing is letting go of people you love. But it may be one of the best decisions of the year for me. Prayers are appreciated as I go through this process. Thanks. I have reconciled with a girl friend. 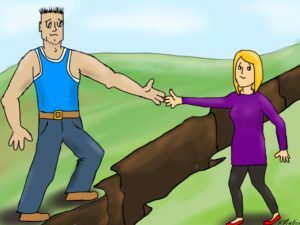 We became Christians as we were both going through divorce. I was her emotional rock. She did something that was very disaponting and ended our friendship. During this time Jesus became my rock. I have three adult children. I had no contact with two of them for several years, I have forgiven them but reconciliation hasn’t happened yet. In a chance meeting I met my daughter and her 3 year old son, my grandson. I prayed that I would be given a chance to ask for forgiveness and be reconciled. I was so surprised to see her, but I handled it well. I told her I loved her and gave them hugs. She didn’t respond. I asked her how can we move on. No answer. I asked her what I did, she told me she was locked outside on a freezing day. I asked her to forgive me. She stayed rigid. I asked if there was anything else. She said she had to take the bus to dance lessons. I again asked for forgiveness. Still holding her stance I then asked if there was anything else. She said her friend’s father had to drive her to drive a lesson. Her friend’s dad drove her. For the third time I asked her for forgiveness. It was only with the Holy Spirit that I didn’t defend and get offended. She told me she had a good life and wants me to stay out of it. I am able to handle her decision because of my relationship with The Lord and His love. I called my son but that wasn’t too well received. I am thankful that my third child includes me in his life.